All three titles are intriguing. Charlene Carr is a magical author wh0se books in this boxed set will give readers such wonderful reading. Readers will find this set to be a warm and heartfelt reading experience, with romance and soul. 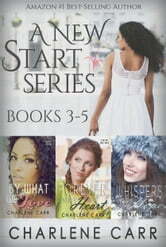 This is an awesome series written by an author who writes like it all happened to her. You can identify with the women in thses books, the themes of broken childhoods, wanting self-suffiency as a adult woman, reproductive health problems, trying to support family, being adopted or a natural child, IVF, and even Book 1 in the series, SKINNY ME, with its topics of grief, dealing with personal and family obesity, overcoming obesity and emotional eating patterns, these are all themes most women can relate to in some time of their lives. I could really relate to these characters. They are written with feelings and thoughts that are believable and sound natural not forced as are the dialogues between characters. The only thing I found difficult to believe was that the characters didn't do more swearing when they were really struggling, however there is more than enough of that in real life so I was willing to forgive that seeming overly clean-ness because the stories/characters are so compelling.